Google+ is a place to for people to interact on the web the way they interact day to day. It takes the giant social networking worlds of Facebook and Twitter and pares them down to mirror the way we interact offline – in smaller, focused groups. 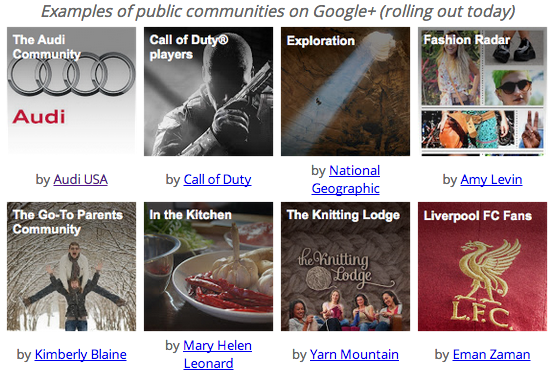 The recent addition of Google+ Communities does this in a more meaningful and relevant way. It provides a platform for people to discuss, share, inform, and chat about common topics of interest. Google discusses the possibilities of the platform on their blog. So, how does Google+ Communities work? And how might you harness its power for your business? Members of a community aren’t posting to a public stream. Their comments are only seen by members of the community in which they posted. All members of that community actively signed up to take part in it. This means that people share relevant information with only the people that care about that information. For example, if I just read a new book I loved, I’d comment about it in my “Book Club” community. All my fellow booklovers would get a suggestion for their next great read, or could contribute thoughts if they’ve already read it. I guarantee that my comments are being received by an audience who cares, and I start a conversation with interested and receptive individuals about a specific topic. I also have the option of starting a hangout, giving me the opportunity to have an impromptu discussion via a video chat with up to 10 people at once. Do you have past or current customers that love your product or service? Invite your brand evangelists to share their thoughts, and create communities around those ideas. If you own a custom pool building company, you might create communities focused on topics like “Pool Parties” or “Backyard Design.” Members of the “Pool Parties” community could post ideas for decorations, food, and activities that will appeal to other members. The “Backyard Design” community could serve as a forum for members exploring design options for pools, landscaping, or outdoor kitchen areas. This is great for digital engagement of your super fans. Current customers can discuss ways they use their outdoor oasis, past customers can glimpse what upgrades they might want (that deck and outdoor kitchen would be great by our pool! ), and potential customers can see the possibilities a new pool brings. These two communities provide focused forums for people to discuss both how they could use your product and how they do use your product. In short, Google+ Communities allows you to invite new customers or interested parties to learn more from people who use and love your product. Even better, Google+ Communities are moderated, so you can choose an appropriate degree of moderation and choose to appoint other moderators. Not only will you provide a helpful and useful forum for people to share thoughts and ideas (and pictures and videos, too! ), but your product will also naturally be featured in these discussions. Check out our free ebook below for more tips on enhancing your marketing with social media, including Google+.